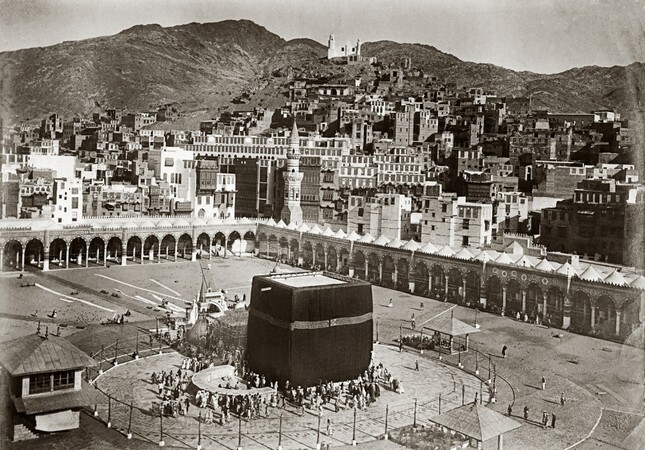 Ottoman sultans' interest in Mecca, Medina and Jerusalem – the three most cities lands in Islam – dates back centuries. When al-Hejaz, the area that includes Mecca and Medina, was ruled by the Mamluks, Sultan Mehmed I initiated a tradition of sending Hejaz an official regiment called Surre-i Hümayun (Imperial Pouch). Escorted by officials, the Surre-i Hümayun set out from Istanbul on camels every year. In addition to precious gifts such as chandeliers and draperies they carried gifts for prominent scholars in Hejaz and charity for the needy. Commoners also sent gifts and charity to Mecca and Medina with the regiment. There were needy people in the holy lands who prayed specially for those in Constantinople. People from Anatolia who visited Hejaz as pilgrims were part of this regiment. As sultans were excused from the hajj due to their title as caliph, they sent representatives instead. These representatives generally became the heads of the regiment who were responsible for the entire group. The Surre regiment was sent off with a farewell ceremony that was a tradition practiced until 1916. When the emir of Hejaz presented the key to Mecca to the sultan in 1517 upon the conquest of Egypt, Ottoman sultans proudly received the title "servant of Mecca and Medina." Thus, when the imam of the Grand Mosque in Damascus called the sultan "the ruler of Mecca and Medina," Sultan Selim I objected to the title and corrected it by saying, "the servant of Mecca and Medina." All of the work done by sultans showed that they were worthy of the title. The sultans' service to Islam and Mecca and Medina, apart from the Rashidun Caliphate of the four caliphs, Abu Bakr, Umar, Uthman ibn Affan, and Ali, were far beyond the service offered by previous Islamic empires. When one of the brooms specially used in sweeping the inside of the Kaaba was brought, Selim I raised the broom like a crown and put it on top of his head. The story of the sign of the crest seen on the crowns of his successors has its origin in that broom. Sultan Süleyman the Magnificent service to the holy lands of Mecca, Medina and Jerusalem was unmatched. During Süleyman's reign n, the roof of the Kaaba and the minarets of the Masjid al-Nabawi were repaired with a construction foremen sent from Istanbul. The interior ornaments of the domes were renovated. He had a second shrine to the right side of the mosque built to prevent the Hanafiyyah imam from praying in the shrine where Prophet Muhammad used to pray out of respect. He also repaired the original shrine. Tombs were built at al-Baqi and for those killed in the Battle of Uhud. He had the Quba Mosque and Masjid al-Qiblatain renovated. Additionally, a dome was added on top of the house where Muhammad was born. He also sent two pendants, two for the Kaaba and one for this house. Four madrassas were built for the four schools of Islam: Hanafi, Maliki, Shafii, Hanbali, in Mecca. A silver water slot added to the Kaaba, which was then followed by a golden one from Sultan Ahmed I. The Zamzam Well was renovated and a pool was built for the well water. Later, a dome was added on top of the pool by order of Sultan Mehmed IV. An ornamented room was built for the well in the time of Sultan Abdülhamid I, but it was demolished in 1963. Süleyman repaired Al-Aqsa Mosque and built 3 kilometers of walls around Jerusalem, which still stand today. He also repaired the channels that brought water to the city, renovated the city water pools and built six new fountains. Süleyman's wife, Hürrem Sultan, had a soup kitchen built to serve the needy in Mecca and Medina in addition to a hospital in Mecca, which was a counterpart to Haseki Hospital in Constantinople. The complex, including a mosque, madrasah, inn, soup kitchen and dervish lodge, built by Hürrem Sultan in 1551, is the most important foundation in Jerusalem. Süleyman and Hürrem's daughter, Mihrimah Sultan, repaired obstructed water lines so Arafat and Mecca had water again. Her son, Sultan Selim II, continued the same service. The colonnades at the Kaaba were also completed in his time with a project conducted by Mimar Sinan. Selim II gave batons to pilgrims as gifts, which were made personally by him. The marble shrine with 12 stairs, which still exists, was sent from Constantinople in 1590 by Sultan Murad III. Mehmed III renovated the minaret at the top of Bab al-Salam in addition to minarets and a dome added to the top of the house where Muhammad was born. Engraved and prepared in Cairo over the years, the cover of the Kaaba was prepared in a special atelier where the Beylerbeyi Mosque now stands and sent to Hejaz every year with the Surre regiment in the time of Sultan Ahmed I. Special candles used in the Haram al-Sharif were also produced there and sent to Mecca. Sultan Ahmed I sent two oil-lamps adorned with diamonds to hang in the Haram al-Sharif and Masjid al-Nabawi. The present-day version of the Kaaba, which was damaged due to flooding, is an heirloom of Sultan Murad IV from 1635. In memory of his heirloom, one of the gates of the Kaaba is called "Bab al-Muradi" (Gate of Murad). The golden gate he built for the Kaaba is preserved in the Museum of Islam in Mecca. Ottomans banned construction of structures taller than the Kaaba and the shrine of Muhammad so they both could be seen from far away. Sultan Mehmed IV had the minarets of the Haram al-Sharif repaired and enlarged the circumambulation ground. Also, special stones were placed in the area so that pilgrims' feet would not be affected by heat. Many oil-lamps were placed between the hills of Safa and Marwa. Round stairs similar to the 27-stair minaret at the Rukun al-Iraqi – the northern corner of the Kaaba – were renovated by Sultan Mustafa II. The golden cover for the Hajar al-Aswad (Black Stone) was also made by order of Mustafa II. Three of the six columns at the Kaaba, which are preserved in the Museum of Islam in Mecca now, were also renovated in his time. He repaired the Quba Mosque and constructed a minaret for it. Water lines were cleared. The Mawlid tradition was initiated in Mecca. On the holy night on which the birth of Muhammad is marked, a crowd visited the masjid near the house where Muhammad was born with candles and prayed. Sultan Ahmed III renovated the floor of the circumambulation ground. Sultan Abdülhamid I repaired the Haram al-Sharif and Maqam Ibrahim. Madrassas and libraries were built in Medina. An ode in Arabic in praise of the prophet were placed on the walls of Hujra al-Saada where Prophet Muhammad was buried with Abu Bakr as Siddiq and Umar ibn al-Khattab. The ode was taken back in 1992, as it is not compatible with official doctrine in Saudi Arabia. Wahhabis, who rebelled in Najd in the time of Sultan Selim III, raided Hejaz and massacred the people in Mecca and Medina and leveled the area. They turned the area into a desert by demolishing shrines, mosques and visiting places that were built by the Ottomans. Busy with other problems at the time, the Ottoman Empire assigned Mehmed Ali Pasha, the governor of Cairo, to suppress the revolt. After getting rid of the rebels, Sultan Mahmud II rebuilt everything that had been damaged. The bricks and leaden green dome were renovated. His poem, which was written in 1819 while he was sending golden chandeliers as gifts to Hujra al-Saada to praise Muhammad, is a sign of love and respect for the prophet from the sultans. Due to incidents in Egypt and Morea, the janissary crisis and the war with Russia, Sultan Mahmud II hardly had a chance to repair Hejaz. His son, Sultan Abdülmecid, made an astonishing effort to adorn these values after his father. Among the rulers of the Islamic world, Abdülmecid was the one who served Mecca and Medina the most. The Kaaba and Haram al-Sharif were thoroughly repaired on order of Sultan Abdülmecid, and the Golden Gutter was renovated. The Masjid al-Nabawi in Medina was reconstructed on its original foundation and without changing the positions of the columns. The present-day building is his work. His name was given to the Bab al-Mejidi (Gate of Abdülmecid) with his signature engraved on a band. He also repaired and extended water lines called in Medina. Under the special bricks that were to be placed on the floor of the Hujra al-Saada, Abdülmecid had his name engraved so that it would be trampled on by pilgrims. He also rejected words of praise set to be engraved on the Bab al-Salaam that was used by Muhammad while entering the Kaaba that said: "The sultanate of both worlds belongs to the Prophet Muhammad." By putting a miniature of Masjid al-Nabawi – 53 times smaller than its original version – in the Hırka-i Sharif Mosque in Constantinople, he followed the repair process via reports shown on this miniature. The repair of Mecca and Medina, which was conducted under harsh conditions at the time, cost 700,000 gold coins. The repair of Al-Aqsa Mosque cost 20,000 gold coins. Thus, Abdülmecid deserved the title The Caliph of Muslims and the Servant of Mecca and Medina. When he received important reports on his sickbed the day before his death, he suddenly wanted to sit up, as it was the turn for Medina reports. "Stop reading! Make me sit down! They are the neighbors of our Prophet Muhammad. I'm ashamed to listen to the report lying down on my bed. Please do whatever they demand! But nevertheless, read the report. Let my ears be delighted!" he said. The respect, favors and services of Abdülhamid II were not limited to holy places, as they were bestowed on the people of Hejaz. He repaired and adorned the Haram al-Sharif. The tomb of Khadija and the houses where Muhammad and Fatimah were born were renovated. Mina was bestowed with water supply networks. Water lines put in service by Süleyman were cleared and extended to serve pilgrims again. A grand pool was installed near the Kaaba. To make pilgrimage easier, he built a train network for Muslims that reached Medina. Under this railroad, his name was engraved to be trampled on by pilgrims. During construction of the Medina station, a masonry workshop was built outside of Medina so that the soul of Muhammad would not be disturbed by the noise. For the same reason, the railroad near Medina had mats. Since the people of Mecca had to host pilgrims in their homes during the hajj, sultans built free guesthouses especially for pilgrims from every region. Mecca and Medina were governed with justice and respect by the Ottomans, and holy places were repaired and adorned by them. The people of these cities spent their lives in high and easy circumstances. This time of happiness continued until World War I. Ottoman rule of Arabia and Hejaz ended in 1916.